Also serving communities of Sumner, Milton, Buckley. There are 6 Memory Care Facilities in the Puyallup area, with 4 in Puyallup and 2 nearby. The average cost of memory care in Puyallup is $4,872 per month. This is higher than the national median of $4,650. Cheaper nearby regions include Tacoma with an average starting cost of $3,847. To help you with your search, browse the 16 reviews below for memory care facilities in Puyallup. On average, consumers rate memory care in Puyallup 3.8 out of 5 stars. Better rated regions include Federal Way with an average rating of 5.0 out of 5 stars. Caring.com has helped thousands of families find high-quality senior care. To speak with one of our Family Advisors about memory care options and costs in Puyallup, call (855) 863-8283. Puyallup is a small city, located 35 miles south of Seattle, with a population of 41,001. About 14 percent of residents are seniors, and the city's 14 memory care facilities help to support the 106,644 seniors with dementia, Alzheimer's disease, and other memory care conditions throughout the state. Memory care facilities in Washington must adhere to the Enhanced Adult Residential Care – Specialized Dementia Care contract to provide sufficient care for residents. These facilities are officially called dementia care facilities in the state. Administrators and caregivers in memory care facilities receive additional training so they can better work with seniors who have memory-related conditions. To make the experience of residents more comfortable, the daily activities are tailored to match each individual’s interests and hobbies. The senior's family are also included in the managing of their treatment. On average, Puyallup has only 142 days of sunny weather throughout the year. Summer days have an average high in the mid-70s, so seniors who enjoy mild summers could find that season appealing. But, rain is common and in the winter the average low drops to 35 degrees Fahrenheit. The cost of living in the city is a full 30 percent above the national average. Housing is 80 percent above the average, and transportation is 32 percent higher. Healthcare is a bright spot with a cost 20 percent below the national average. Seniors considering living in the city should take these costs into account. Ninety-eight percent of the nation's cities have less crime per capita than Puyallup. Property crime is two to three times as prevalent as the national rate in Puyallup, but violent crime mostly equals the national average, except for a lower prevalence of assault and more robberies per capita. Seniors should consider moving into safer neighborhoods in facilities with good security. There is no income tax in the state of Washington. Seniors receive retirement benefits and Social Security income without deductions. However, the state's sales tax rate is among the highest in the nation. Ultimately, the tax situation in the state balances out in seniors' favor due to the lack of income tax. Memory Care costs in Puyallup start around $4,872 per month on average, while the nationwide average cost of memory care is $4,799 per month. It’s important to note that memory care rates in Puyallup and the surrounding suburbs can vary widely based on factors such as location, the level of care needed, apartment size and the types of amenities offered at each community. Puyallup and the surrounding area are home to numerous government agencies and non-profit organizations offering help for seniors searching for or currently residing in an assisted living community. These organizations can also provide assistance in a number of other eldercare services such as geriatric care management, elder law advice, estate planning, finding home care and health and wellness programs. To see a list of free memory care resources in Puyallup, please visit our Assisted Living in Washington page. 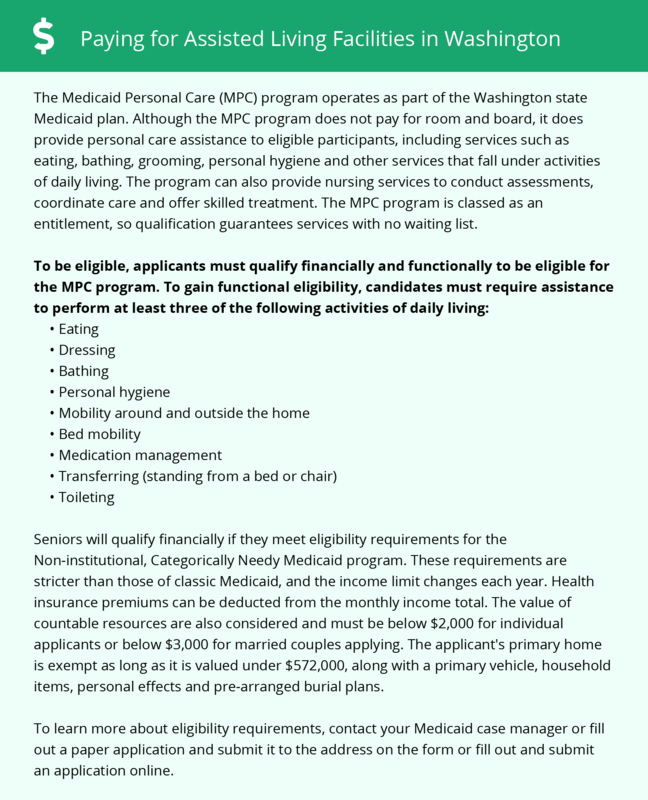 Puyallup-area assisted living communities must adhere to the comprehensive set of state laws and regulations that all assisted living communities in Washington are required to follow. Visit our Memory Care in Washington page for more information about these laws.